We are prepared to work with you on procedures which will not supplant the role of the familiar interrogators, but which will allow our staff members to observe questioning in real time and then to put forward to the interrogators immediate, essential follow-up questioning, with the opportunity to independently evaluate the replies. We believe that one-way glass, adjoining rooms or similar techniques can accommodate our mutual concerns. The procedures we have proposed will enable the Commission to form its own independent evaluation of the credibility of the conspirators’ statements. In other words, it appears that whoever made these annotations appears to have been most worried that Commission staff members could make independent judgments about the detainees and the interrogations. 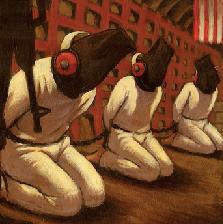 Addington–or whoever this was–didn’t want anyone to independently evaluate the interrogations conducted in the torture program. One more point: the Commission made it clear that they needed to view interrogations directly because they had identified gaps in the narrative as early as the previous October, but in several rounds of clarifying questions the Administration hadn’t been able to close those gaps. In October we provided two memoranda detailing many specific anomalies and gaps in the reports, and listing certain questions we asked to be posed to the conspirators. The intelligence community answered as best it could in November, but only a few of our submitted questions have been addressed. The various substantive problems remain after analyzing even the most recent information we have received. We cannot detail these problems in this unclassified letter. Particularly given that the 9/11 Commission used only 10 pieces of intelligence from Abu Zubaydah(and just 16 from Rahim al-Nashiri) you can imagine what would have looked like gaping holes. Here were al Qaeda’s number 3 and the purported mastermind of the Cole bombing, and yet they provided little information about those subjects (or at least, little that Commission staffers found credible). Indeed, by the time the Commission made their request, most of the information they had received had to do with the popularity of different al Qaeda figures (the accuracy of some of which the Commission doubted), another doubted claim about KSM’s plan on 9/11, and about Osama bin Laden’s response to the Cole bombing. They were probably wondering why some of the only credible information unique to AZ pertained to a training camp–Khalden–that wasn’t even formally affiliated with al Qaeda. They were probably wondering why it looked like Abu Zubaydah wasn’t really part of al Qaeda at all. At the very least, letting Commission staffers view the interrogations would have showed that the interrogators were incompetent at what they were doing (which, Zelikow has made clear, was already becoming apparent from the interrogation reports anyway). But, too, there was another risk. If Commission staffers saw some of these detainees in person, it would become clear that they weren’t who the Administration claimed them to be.